Unlike a lot Canadians, particularly those living in Ontario, I love that highway. The thought of going for a drive upon it fills me with excitement. Highway “four-oh-one”, as its most commonly referred to – or to use its official name, the Macdonald-Cartier Freeway – spans about 828 km across southern Ontario from the Quebec border in the east to Windsor in the west, and in parts is one of busiest highways in the world. At its widest where it crosses the populous city of Toronto and its suburban hinterlands, the highway’s girth stretches to an imposing 16 lanes, which, according to Wikipedia, makes it one of the widest highways in the world. But then, away from major cities and the at times shocking volume of cars (and even more shocking gridlock), it shrinks to four lanes like some run-of-the-mill regional road. Every 80 km or so, both sides of the highway are furnished with convenient rest stops that include fast food outlets, washrooms, gas stations, picnic areas, wi-fi, and accommodations for large transport trucks. Over the 10 years I previously lived in Ontario, I drove the 401’s complete length. 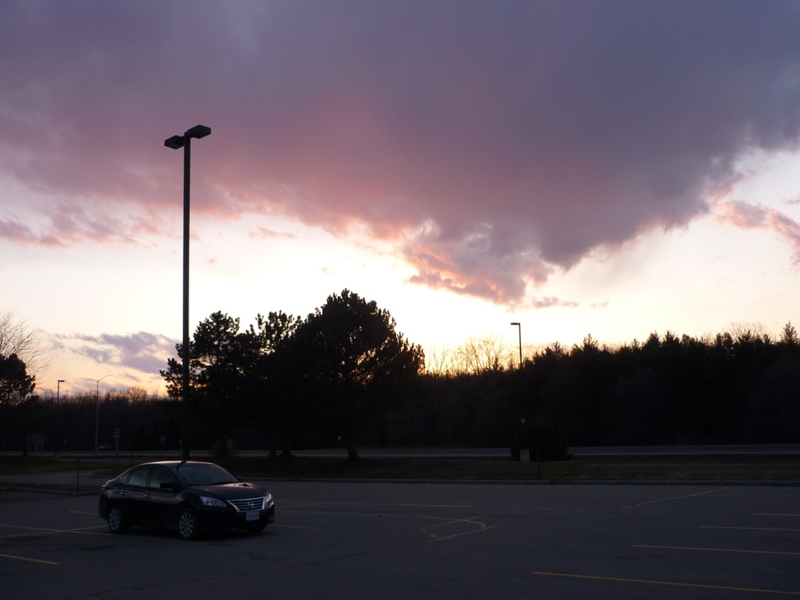 I drove the highway yet again during my recent trip to Ontario over Easter – 800 km roundtrip from Toronto to Windsor to visit some friends – and was surprised by the nostalgia it induced in me. The first time I drove the 401 by myself was also during the lead-up to Easter, and also along the Toronto-Windsor corridor. I was working for the national park service at the time, living literally inside the park and had no car of my own. I was entirely dependent on others letting me tag along on their grocery trips and for entertainment, which was both humbling and at times inconvenient. But at the same time, I’d not had my license very long (I was in my 20s when I finally got it) and didn’t think of myself as having the ability (if not the necessary equipment) to go where I wanted when I wanted. It had never occurred to me that the only thing holding me back from the life of freedom and adventure I’d always wanted was myself and my own apathy. Until a colleague recommended I solve my problems with soliciting a ride to the nearest (60 km away) train station to get to Toronto by renting a vehicle and driving to Toronto there myself. I think I actually grew as a person in that moment. During the next two years, I must have spent close to 100 hours driving that highway, getting out there and getting a life: visiting family and friends; going camping; going to parties and concerts; going to buy my first acoustic guitar. That first Easter drive, truth be told, was f*cking terrifying. There’s a spot on the route just outside Mississauga where the road suddenly fans out to 16 lanes as if it’s been combed by a mascara brush. The first time I reached that spot, my hands started sweating so badly, I had to hold them in front of the AC vents so I could properly grip the wheel. However, I later discovered that singing while driving gave me something else to focus on besides the fast-moving traffic and making lane changes at high speed. It’s a habit that’s since become a passion: I’ve always loved music and when alone in a car singing, there’s no one anywhere to worry about disturbing. In 2007, I sang the entire nine-hour drive from the national park where I lived to Quebec for a solo camping trip that took me along the 401’s complete eastern stretch. The last little bit, from Exit 48 where one turns off to get to the park to the end of the line in Windsor, I just managed to complete in 2008 prior to moving out west to Vancouver – a decision, among others, I’d spent hours pondering while driving. Almost every time I go back to Ontario, I drive somewhere on the 401 to see someone or something of those aspects of my life still spaced out along the road some seven years later. To this day, these road trips give me long, uninterrupted spans of time to just be with myself – to contemplate my life and where it’s going and what I want to do with it next to the rhythm of passing cities, fields, hydro corridors, wind turbines, and, of course, the music piping through the car speakers (and my lungs). For me, the 401 symbolisms adventure and escape and my growing up from a kid waiting to be given permission to an adult who can make choices and changes for herself. As if life, as the song says, truly were a highway. Do you like going on road trips? Is there a particular road you really like to drive? Tell me about it in the comments. This entry was posted in Travel and tagged Driving, Highway 401, Highways, Memories, Ontario, Real life. Bookmark the permalink. I don’t mind driving; I’ve been doing it for almost 50 years. It’s a means to an end. And when I used to be afraid of tunnels, it would take twice through ‘If all of the raindrops were Hershey bars and gumdrops’ to drive the whole of each of the long mountain tunnels toward Pittsburgh – when I had to drive there for one of my kids in college. I don’t like driving through tunnels because you’re supposed to take your sunglasses off while doing so, but my sunglasses are prescription so I can’t see without them. But because it’s dark in tunnels, I can’t see that well with sunglasses on either (hence the warning to take them off). Generally, I try to avoid tunnels.